After over 25 years of campaigning experience, Rupert Matthews has finally decided to tell all. 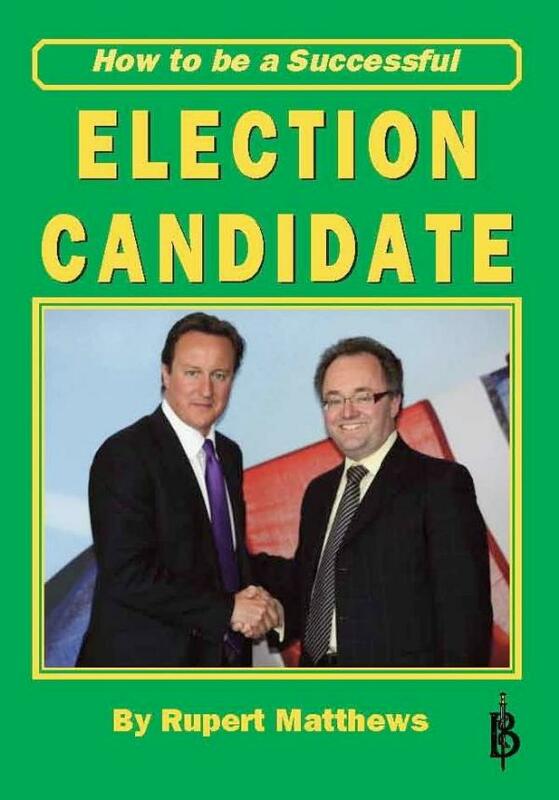 Whether you are standing for local council, parliament or other elected office, this is the book for you. From how to dress for the public to how to deal with the press, from how to write leaflets to how to organise a petition, Rupert covers all the basics of running a successful political campaign. He also includes easy to follow, step by step guidance to the legal minefield that is modern political campaigning. Rupert also spills the beans on the darker arts of campaigning, explaining the tricks and turns of the backroom boys that are essential to any winning candidate, but which rarely get talked about and are never acknowledged in public. Rupert Matthews is a former staffer at Conservative Central Office who has acted as a freelance campaign manager on parliamentary by elections. He has stood himself as a candidate at Council, Parliamentary and European elections. He is recognised by friends and foes alike as one of the most dynamic and innovative political campaign managers in the business. It is a lot more important than most people think that you should look the part as a candidate. All eyes will be on you, and how you look will help people form an impression of you before you say a single word. Whatever the chattering classes might like to think, the average voter does not want to be represented in the town hall or in Parliament by a slob. Of course, you don’t need to be the candidate all the time. When you are at home scoffing a takeaway in front of the television, you can behave as you like. But whenever you are taking part in candidate activity — whether it is at a social function, knocking on doors or at a meeting — you will be on show and must behave accordingly. As the election approaches and you become better known to the voting public (well that is the plan anyway) you are more likely to be recognised as the candidate even if you are just at the hairdresser’s or down the pub with some friends. If you stand a chance of winning, this will be even more the case. Take a bit more care in the month or so before polling day. People may recognise you and remember your actions. It does not matter if you are tall or short, fat or thin, dark or fair, young or old. But it does matter that you are smart and show that you have taken the trouble to care. This is not difficult. You need to be neat, clean and well presented. Get your hair cut for a start, and have a shower or bath every day. Clothes can be more problematic as what is suitable depends very much on what sort of an area you are standing in. A pinstriped suit won’t work in deepest Devon any more than a lovingly worn tweed jacket will work in Peckham. Basically, you need to dress in a way that is appropriate to the average voter in the area where you are the candidate — but be a tiny shade better to show you are worthy of their vote. As a rough rule of thumb have a look at how people are dressed in the local high street. Then imagine one of them is going for a job interview. Imagine how would they dress? Then dress like that. If you are standing for one of the more important positions, such as Parliament, you will need to have to hand some more formal clothing. If you are a man you should have one lounge suit for when you need to look businesslike. Dark grey or dark blue are good choices. Get a couple of different shirts (one to wear one in the wash) and perhaps half a dozen ties to ring the changes. You will also need what is called a smart-casual outfit. This might be a blazer, a sports jacket or a zip up cardigan paired with open neck shirt and trousers (not jeans). Many men are not terribly good at picking what colours go together. If you don’t feel confident about this, ask a woman to help you. If you are a woman, you will again need one business outfit and a smart casual outfit for different occasions. Try to avoid big dots, wide stripes or big floral prints. They might look great on, but in the sort of head and shoulders photo used on leaflets and in the press they can look pretty poor. Jewellery should also be fairly toned down. It may be unfair, but many voters find the more flashy female clothes distracting, and they may form the impression that you are flighty rather than serious. Whether you are male or female, you have to accept that campaigning involves being outside a lot. And the Great British Weather is not always going to be kind to you. You are going to need a good quality raincoat that keeps the rain out, and a rain-proof hat as well. Some prefer a big umbrella, but I always find that an umbrella gets in the way when you are rummaging in the back of a car for leaflets or trying to note down what a voter is saying to you. And when the weather is nice, you will risk sunburn. Keep a tube of sun cream handy, and wear a straw hat. Most important of all will be your footwear. Indoors or outdoors, a candidate spends an inordinate amount of time standing up and walking around. You will need stout, sensible and comfortable footwear or you will never make it to the end of the campaign. I have to hand an old pair of leather boots that lace well up past the ankle for outdoor work, and a pair of equally old brogue shoes for indoors. Choose your footwear with care. Your boots might very well end up being your best friends on campaign. You really can’t get away from this. If you are a candidate, you are going to have to say something in public to a lot of people. It may only be your thanks to the Returning Officer and their staff after you have lost, but sooner or later you are going to have to speak. You had better make it sooner. I have always been of the “stand up, speak up, shut up” school of public speaking. I don’t go in for fancy rhetoric. I work out what I want to say, then I stand up and say it, then say it again in a slightly different way (repetition always works), and then I sit down again. Getting the message across clearly is much more important than an elegant turn of phrase. There are plenty of books out there giving advice on public speaking, and I don’t intend to repeat what they have to say. There is only one key piece of advice on the subject that I wish to give: Never ever miss an opportunity to speak. Practice makes perfect in public speaking as in so many other things. So get up and make your mistakes early, then when it really counts you will be a competent speaker. You will hear this phrase a lot. Most people in politics think that this is a key task of a candidate, though whether you will ever be called upon to do it is another question entirely. Basically, “working a room” means walking into a room packed full of total strangers and managing to make pleasant small talk with every person there. Nobody expects the conversation to be anything other than superficial, but nobody expects to be left out either. Usually you will be expected to work a room when you are visiting an organization other than your own political party. You should, therefore, have somebody showing you around who will introduce you to people, allow you to chat for a few minutes and then tactfully drag you away to meet the next person. If you have not got such a person showing you around then it is up to you to introduce yourself (which is fairly easy) and then to disengage yourself (which is not). First, remember that you are going to be meeting people up close and personal. Check your fingernails are clean and that you don’t have a bit of spinach stuck between your teeth. Second, always shake hands firmly. Nobody likes a wet haddock slapped in their hand. Third, always enunciate your name clearly. I am “Rupert Matthews”, not “wooper maffoo”. Fourth, always repeat the name of the person you are talking to. Say “Hello, Mary” as you start to chat and “nice to have met you, Mary” when leaving. It helps to lodge the name in your brain. Names are crucial. Everyone likes to feel that they are important enough to have been remembered. Mind you, one MP I know is terrible with names, but brilliant with facts. He is a wonder to watch at this sort of thing. “Hello,” he will say to somebody he met once a year ago. “How is your son getting on at university, Exeter wasn’t it?” and off he goes on a friendly chat that wins him an instant friend and supporter. But he never has a clue to whom he is talking. Forgets names instantly, apparently. Fifth, never look over or past the person you are talking to. While you are talking to them they are the most important person in the room. Sixth, always make time for the youngsters. They are unlikely to be important in their own right, but their mother might be the chairman. Seventh, always have a quick chat with anyone who is sitting quietly in a corner, especially if they are elderly. They will appreciate your effort, and they are often the long term members who can give you the gossip on who’s who in the room. Eighth, when you get home jot down any names that you can remember. Ninth, always write a letter to whoever invited you or arranged your visit. Make a point of saying how much you enjoyed the event and mention the names of a few people that you met. As a candidate you will soon find that you have an astonishingly varied diet of food and drink to cope with. Some days you will get no food at all, the next you will be given two huge dinners in less than two hours. You will just have to learn to live with it, I’m afraid. Whatever you are given, eat it with obvious pleasure. People offer you food to be hospitable, and they want and expect you to be duly grateful. Sometimes you will be offered home-made food that has taken hours to produce. Your duty is to enjoy it, and to be seen to enjoy it. The only valid excuse for not eating something is that you have a life-threatening allergy to the object in question. Oh, and don’t lie about an allergy any more than you would lie about anything else (see below). If you tell someone you are allergic to nuts to avoid a plateful of nutloaf, then you can rely on it that two years later you will be seen by that person happily scoffing up walnut cake at some future event. I personally hate bananas with a venom that I find difficult to get across in words, but have scoffed up banana cake on campaign with every sign of great appreciation. That is my bad luck. I chose to be a candidate, nobody made me volunteer, so down the hatch go the hated bananas. Alcoholic drinks should generally be avoided. Always go for the soft drink option if you possibly can. Booze can have an unnerving effect on the vocal chords. You may end up saying inappropriate things, forgetting who people are and blurting out some campaign secret that you were meant to keep to yourself. This goes double if you are going to be doing any public speaking. I once attended a dinner at which the guest speaker was an MEP of some years standing and reputation. He obviously looked upon the wine when it was red during dinner, and as a result his speech turned into a rambling succession of boring anecdotes about how wonderful he was. If you are going to attend an event at which you will be absolutely unable to avoid having an alcoholic drink then DO NOT DRIVE. Even if you intend only to have half a glass of sherry then DO NOT DRIVE. Accidents can happen to anyone, and you could prang your car when stone cold sober. But if you reverse into a gatepost half an hour after everyone saw you with a wine glass in your hand then they will draw only one conclusion, even if it is the wrong one. So no matter what the circumstances, if you have a drink DO NOT DRIVE. Get somebody else to drive, or take the bus. All this talk about food and drink brings us on to another subject that is a key stumbling block for many first time candidates: toilets. We are all human, we all need to go to the toilet. As a candidate you never know when you are going to see a toilet again. So always go to the toilet at every possible opportunity, preferably when you are just about to leave a venue. There is nothing worse than arriving at some event absolutely bursting to go and, instead of greeting the people who have come to meet you, having to dash for the nearest toilet. It makes a very bad impression.